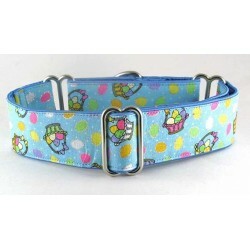 Put a spring in your pooch's step with these fun spring collars. 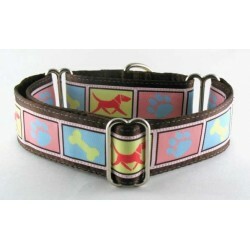 All are available in both martingale and side-release buckle styles. 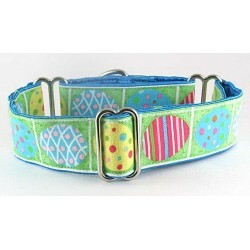 Spring Fever Collection There are 41 products. 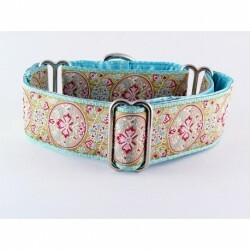 Antoinette martingale or snap-relase buckle dog collar embellished with a lovely, woven aqua, turquoise, taupe and rose trim. 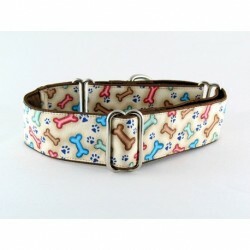 Bloomin' Bones martingale or snap-relase buckle dog collar featuring colorful bones on a light brown background. 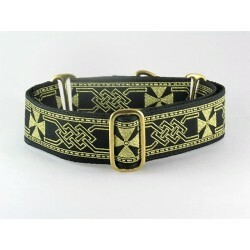 Celestine martingale or snap-relase buckle dog collar displaying a classical medallion motif. 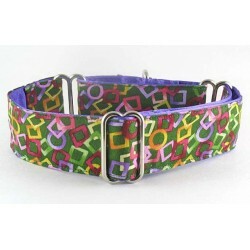 CIrcle Squared martingale or snap-buckle dog collar sporting colorful, fun, geometric shapes. 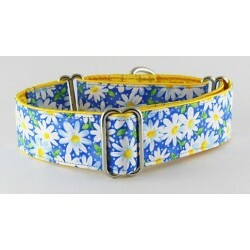 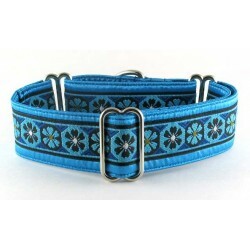 Coming Up Daisies martingale or snap-release buckle dog collar in summer colors of blue, yellow and white. 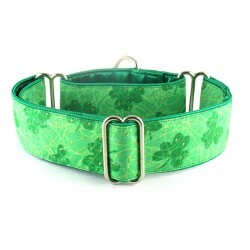 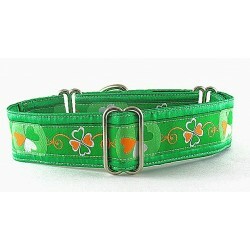 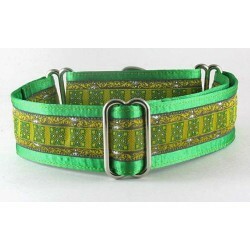 Dublin Square martingale or snap-buckle dog collar embellished with a Celtic Square pattern in shades of yellow, green and charcoal gray. 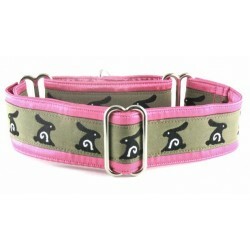 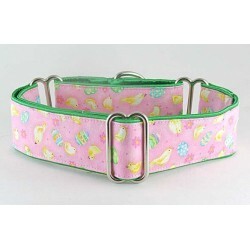 Easter Baskets martingale or snap-buckle dog collar adorned with seasonal Easter Basket and eggs fabric. 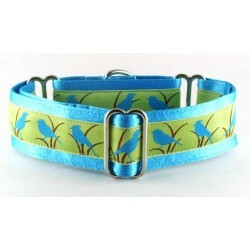 Fine Feathered Friend martingale or snap buckle collar adorned with lovely Blue Birds on a soft green background. 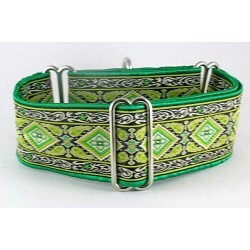 Gillean martingale or snap-buckle dog collar. 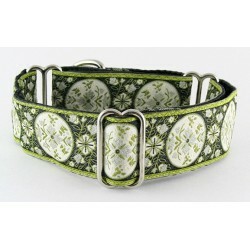 Lovely shades of green, and a white scrolling pattern, are woven through a black background. 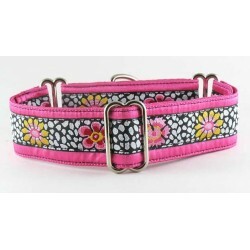 Jacinda martingale or snap-buckle dog collar adorned with flowers resting on a graphic black and white design. 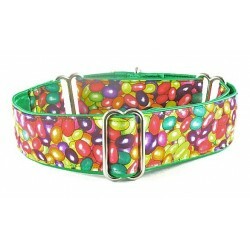 Jelly Bean Heaven martingale or snap-buckle dog collar featuring a bright, fun, festive, candy themed pattern in primary collars. 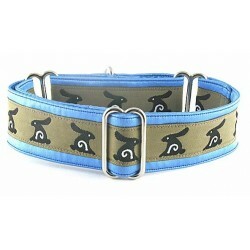 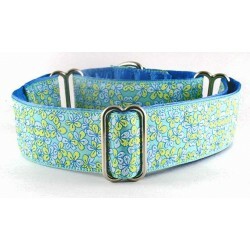 La Petite Fleur martingale or snap-relase buckle dog collar features a lovely floral pattern displaying springtime shades of blue, aqua and yellow. 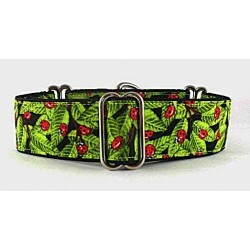 Leafy Ladybugs martingale or snap-relase buckle dog collar with colorful red and black spotted bugs on a bright leafy background.